Post Office Ltd are proposing to move Tean post office into the Pharmacy on the High Street. For full consultation information click here. Most people are aware that a Post Office in any rural village is a very important part of the community. Tean Post Office is no different. 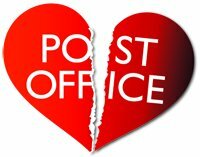 Our local businesses use the post office regularly, however our communities main concern is for our mature residence. Tean and the surrounding area has quite a large population of pension aged members who use this post office weekly to obtain their pension and then proceed to shop on the High Street. If the post office is closed then these pensioners will have no alternative but to embark on at least a 5 mile round trip to the nearest post office using buses that unfortunately in our rural location can be extremely infrequent. Not to mention the loss of High Street business that would be incurred due to people having to use a different Post Office. Please show your support in keeping our village Post Office open by signing our petition. Thank you on behalf of Checkley Parish Council.